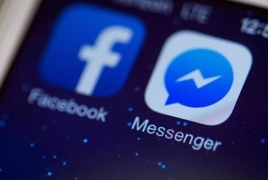 PanARMENIAN.Net - It's a little-known fact that Facebook's chat app can be used to send and receive money, and CNet reveals how to set it up. Messenger payments require a debit card on both ends of the transaction. But there's no cost to use the service, which offers PIN-based protection and "industry-leading security," according to Facebook. Step one: Add your debit card. In the Messenger app for Android, tap the Profile icon, then scroll down and tap Payments. In the iOS app, tap Settings, then Payments. Tap Add New Debit Card and complete that process. Step two: Open a chat with the person you want to send money to or from whom you want to request money. Tap the little "more" icon in the toolbar; it's the one with three dots in a rectangular box. Step three: Tap Payments, then Next to bypass the info screen. By default, you'll be in the Pay screen; enter an amount you want to pay that person and a note indicating what the payment is for. Then tap Pay and you're done! Step four: If you want to request money instead, tap Request at the top of the screen, enter the amount and reason, then tap the Request button to complete the process.